The Global Champagne Masters is a tasting of Champagne organized by The Drink Business. The judging panel is comprised of a selection of highly experienced tasters such as Masters of Champagne, Master Sommeliers and senior buyers making the competition globally renowned. For the 2018 edition Michael Edwards and Patrick Schmitt MW were part of the jury. The wines are judged by their flavours (attributable to the vineyard and vinemaking processes) and by their complexity, intensity and persistence. 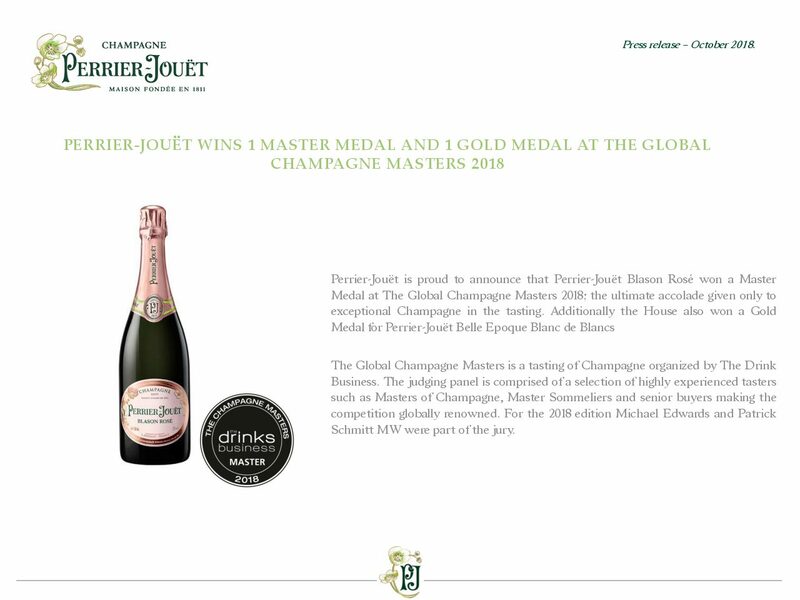 Perrier-Jouët Blason Rosé is the most gourmet wine of the collection, a full and fruity blend that confers generosity and spontaneity. The cuvee is fresh, fruity and floral, with an inviting salmon pink hue. Perrier-Jouët Belle Epoque Blanc de Blancs is not only the rarest Perrier-Jouët cuvée, but also the most emblematic – the culmination of the House’s 200-year expertise in revealing the intricate floral facets of its signature Chardonnay grape. Sourced from two legendary parcels of vines, it is the expression of a single grape variety, a single terroir and a single year – a sublime champagne shimmering with golden light, whose freshness and purity are the exhilarating prelude to an explosion of lush floral notes.